Wellborn Dream Kitchen Makeover Winner! Steve Schmidt, President of Schmidt Homes Remodeling, Inc. would like to announce that Chris Campbell of Lincoln, Nebraska has won the $12,000 Dream Kitchen Makeover sponsored by Wellborn Cabinets, Inc. . She registered with Schmidt Homes Remodeling at their kitchen display, located at Rooms by Tagg 2, during last summer’s Girls Night Out event! Chris Campbell has a daughter currently attending St. Olaf (graduating in 2013). 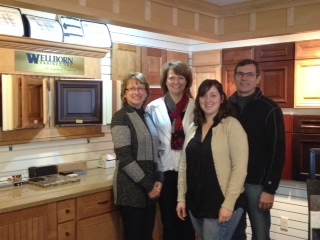 As a Certified Wellborn Cabinetry, Inc. dealer and installer, Schmidt Homes Remodeling, Inc. extended the opportunity to win the Dream Kitchen Makeover by registering at our showroom or at our Kitchen Display in downtown Northfield. Chris was in town to hear her daughter’s St. Olaf choir performance and entered many different drawings that night. The Dream Kitchen Makeover contest ended in September, and Chris was notified that she was the winner! Chris Campbell decided that her brother Mike and sister-in-law Deb were in greater need of a kitchen remodel than herself and generously decided to pass on the winnings! 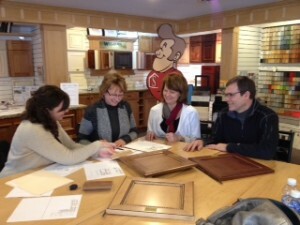 Schmidt Homes Remodeling, Inc. has designed the kitchen remodel and presented the plans to both Chris and Deb this weekend. Both are so excited for the change! A sweet note: Deb and her husband cook together regularly (she says it has really brought them closer over the years), so having increased counter space and more functional cabinetry will greatly increase the joy they share while cooking. 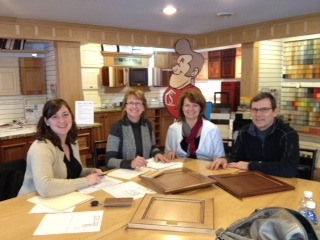 We have just wrapped up another Wellborn Cabinetry Inc. Dream Kitchen Makeover drawing in February, and we hope the newest lucky winner will have registered with Schmidt Homes Remodeling Inc. as well! This entry was posted in Blog on March 5, 2012 by Emily.